Art education is an important component for the growth and development of students at St. Patrick Catholic School. Our students, All-day pre-kindergarten through 8th grade, have the opportunity to explore the visual arts through drawing, painting, design, sculpture, printmaking and ceramics. The art curriculum is designed to develop knowledge and skills in these areas. We study art history and cultural connections within projects and our work is often integrated with grade-level classroom curriculum. 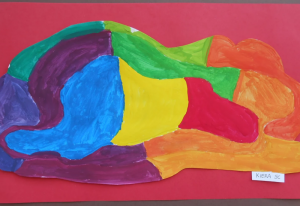 The art room provides a positive environment where children are challenged and supported, celebrating individual differences and developmental stages. Art classes are the perfect outlet for creative problem solving. Creative flexibility and determination are always encouraged. Students will learn to use visual art vocabulary, materials and tools to find success in their art production. Our emphasis is on exploration of various media and technical processes. By trying new things, students learn to take risks, experience skill development and growth in self-confidence. Students learn to critique and evaluate works of art and develop a basic appreciation of art history. All-day pre- kindergarten​ students come to art once a week for 20 minutes. These youngest of our students get to try out, in their own ways, the same media and tools as older students. Art class is very exploratory for these young children. They begin to learn the language and vocabulary of art. Kindergarten students have art twice a week for 30 minutes. These eager artists continue to explore and try out new media while learning more about techniques and vocabulary. Their curiosity and enthusiasm helps them build their skills in many activities from color mixing with paints to constructing with clay. Grades 1-3 have art once a week for 40 minutes and begin to learn about the elements and principles of art. Each student will begin to explore and develop new techniques and better master previously introduced media. Grades 4 and 5 have class once a week for 40 minutes. Students will continue study of techniques and concepts, and are introduced to perspective drawing, more advanced clay projects, painting challenges, printmaking and more. Grades 6-8: In middle school, art is an elective that meets each day for 50 minutes. Students will continue their exploration of techniques and materials. Each student will also further his or her study of art history and cultural art, and create artwork based on that increased knowledge.